If you have old barn woods that are still in good condition and no rot has set into the wood, it is always a good material for you to recycle and make it into good use. The old planks and batten strips covering the old structures are normally much thicker, stronger and having dense nature than the materials used nowadays. Some of them are made of old-growth forests and it is suitable to be made as timber frame for your house, post and beam construction, open ceiling beams, exposed wood beams and for furniture, flooring and moldings. Below are some of the ideas that you can use in order to salvage your old barn woods and enliven your house with a rustic charm look to your interior décor. First of all you need to remove the barn wood away from the barn and bring it to your house. You can use the old barn wood as wanes coating because it makes a great wanes coat especially for your dining room. It will look much nicer if the old boards were previously put up in a board that has batten style. The next step that you need to do is to choose a height for the wanes coat before you start to cut enough pieces at this height to go around the room. A suitable height for the wanes coat is between 30 to 34 inches. It is also ideal use your old barn wood if the original barn wood had been installed in a board and batten style. This will it easier for you to use the wood because you only need to repeat the pattern of a wide board alternating it with a narrow strip your weathered wood so that you can cover the vertical seam where it meets off with the larger boards. After that, you need to run 2 pieces of 1-by-3 inch furring strips around your room’s perimeter. You should do this task at the height of 10 and 20 inches. Then, you need to nail the furring strips to the vertical studs using some #8 or #10 common nails. Make sure that you utilized two nails per stud. Next, take the wider boards of your barn wood and nail them onto the furring strips by using #10 finish nails. You must ensure that each barn board is nailed onto both of the rows of your 1-by-3 furring. You also need to cut holes to cater for any electrical boxes that are located along the lower part of your room. We recommend that you should hire an electrician to move out any electrical boxes from the wall so that it is flush with surface of the barn wood. In order to create a board and batten effect, you should nail the weathered pieces of batten onto the larger pieces of barn wood. To help you accomplish this task, you need to use # 10 or #12 finish nails. You also need to have a cap for your wanes coat and the cap piece should be cut with the same thickness as the rest of the boards. However, it should be ripped to a width of at least 3 inches in order for you to nail them on top of your wanes coat. Then, you can stain the underside of your cap piece so that it will match the barn wood’s color. Take the cap and nail it on top of your wanes coating. You need to place the nails that go right into the wanes coat and some nails at an angle so that they could reach into the vertical studs. You also must ensure that the cut edge of your cap is placed directly against the wall so that the bare wood will not be shown. You need to cut 2 pieces of barn wood that have a similar height of at least 6 feet. You must make sure that they are the wider boards and having the same width. The next step is to cut 5 pieces with a length of 4 feet each and making sure that every piece having a very close actual width to the two boards that you have cut earlier in the step mentioned above. The bottom side of the 4-foot pieces needs to be stain and the stain needs to match the color of your barn wood. Then, you need to cut another 2 pieces of your barn wood at a length of 6 inches where the width should be the same as the rest of the wood pieces. These 2 pieces will be made as spacers that will go below the bottom shelf. You need to glue and nail them onto the vertical side pieces so that the weathered surface will be facing towards the interior edge of your bookcase. In other words, these pieces are designed used for support and also for providing nice appearance. Next, take the 6-inch piece to the back (smooth) side of the 6-foot vertical side piece so that you can nail and glue them. Always ensure that the bottom of both pieces is flush while the smooth back side facing each other once they are nailed and glued. You need to do this method to both sides of the pieces. Secure the shelf by nailing it onto the spacer. You can use some #10 finish nails from the outside of the vertical side piece directly into the edge of your shelf. You will now see the first shelf in place within your bookcase. Even though it will be very unsteady, but you still could make it stand up. After that, you have to cut a pair of spacers with at least the length of 16 inches. Then, glue and nail them into the inside of your vertical side pieces. You also need to ensure that the bottom of these spacers rest precisely on top of the bottom shelf. Next, you should place the next shelf on top of the spacers and nail it the same way mentioned in the above step. The next step is to cut pairs of spacers with the length of 12- inches, 10- inches and 8- inches. After that, you can proceed to complete the shelving of your bookcase using the same manner that you have done for the first two shelves. Finally, you need to cut a diagonal brace and attached them to the back of your bookcase by using #10 finish nails. You must make sure that the weathered side always facing forward. Then, nail the board onto the side pieces and also whatever pieces of shelving that crosses. You must also be certain that it does not extend past the side of the uprights. You must make sure that you have more than enough materials to complete the project. It is always ideal to use barn wood immediately after you have dismantled it off its actual structure. You can also use its baseboard as your nailing surface for your barn wood and also during installation of wanes coat. 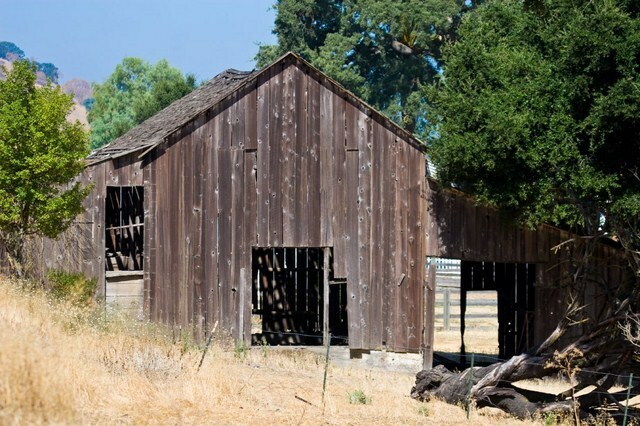 You must check your barn wood thoroughly and ensure that it has no rotten spots and also pest free. If you notice any nails or other metal objects on the barn wood, you need to remove all of them from the barn wood before you do any cutting process. Other items that you can make out of barn wood are a bookcase, end tables and also a small cabinet. This entry was posted in Home Improvement on December 10, 2011 by Mike.